WE ARE ALL GETTING OLDER! Alright, I guess we all knew that no matter how much we are trying to avoid it. In our ongoing quest to look more youthful with all our anti-wrinkle creams and hair dyes to cover up those grey hairs, have you ever wondered why we age in the first place? To celebrate Soph talks science getting another year older I thought I would share an introduction into this topic, but to even begin to understand why we age we need to look past those wrinkles. In fact, we need to look much deeper into our bodies and take a look inside the nucleus of our cells and ask what is it about our cells that allows us to grow old? So there are a whole host of internal and external stresses from our environment such as diet, UV radiation or exercise for example that affect how well our cells can repair any DNA damage and affect the rate of aging. But the reason we humans aren’t immortal is because we have an internal body clock that limits our life expectancy – after all our bodies are not made to last forever! The cells in our body are constantly being replenished whether to remove dead cells, to help us heal or help us grow. And each time our cells divide they have to divide our DNA too. We actually have about 2 metres worth of DNA in every single cell in our bodies! Yes really! So for all that DNA to fit into the nucleus in our cells which is around the same width as one of those pesky grey hairs on your head, it is wound and coiled up into tightly compact structures called chromosomes. 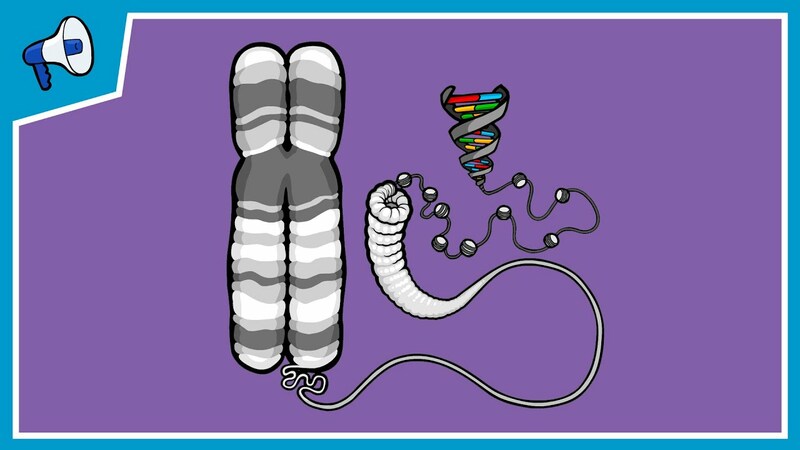 Picture credit: Stated Clearly, YouTube video, What is a Chromosome? Now you would probably think that us mighty humans would have this whole DNA replication thing sussed out right? Well actually our cells aren’t perfect at it – that’s the reason we can accumulate mutations in our DNA over the course of our lifetimes. So, when it comes to replicating our DNA during cell division, well the machinery in our cells actually misses the ends of the chromosomes – so we are actually loosing small pieces of DNA every time our cells divide! But don’t panic – that DNA that is lost isn’t overly important. We actually protect our cells from losing important genes by adding something called telomeres on the ends of our chromosomes. So what are these telomeres? Well, they are just short repeats of 6 base pairs of DNA – TTAGGG. Its essentially meaningless DNA that we can afford to lose in the cell division process. Think of them like the plastic tips on your shoelaces! Just like they protect your shoelaces from fraying, telomeres stop the ends of our chromosomes fraying and sticking to each other which would completely scramble our genetic information. In white blood cells, the length of telomeres ranges from 8,000 base pairs in newborns to 3,000 base pairs in adults and as low as 1,500 in elderly people. For reference, an entire chromosome has about 150 million base pairs. But the problem is as our cells divide, because our cells aren’t perfect at replicating our chromosomes those telomeres get shorter and shorter. Each time a cell divides, it can lose between 30 and 200 base pairs from the ends of its telomeres until they no longer exist. At this point, that cell can no longer divide and enter what is called cellular senescence. Our cells have a replication limit of about 50 divisions and actually helps to prevent cancer; the uncontrollable growth of cells! Once a cell is senescent and can no longer divide, it begins to lose its function and die causing age related characteristics. Kinda like a bomb fuse. Telomeres can also explain why life expectancy is a largely heritable trait from your parents because your starting telomere length you got from them! So can we regenerate our telomeres and stay young forever? We have an enzyme in our cells named telomerase that adds bases to the ends of telomeres. In young cells, telomerase keeps telomeres from wearing down too much. But as cells divide repeatedly, there is not enough telomerase, so the telomeres grow shorter and the cells age. Some flatworms can endlessly regenerate their telomeres which makes them biologically immortal. But as the life expectancy in flatworms is hugely varied and they do actually die, this just shows that there is much more to aging than just telomeres. Immortality and reversing aging is a combination of environmental and many more genetic factors too. So can we make our cells younger? There have been a few reports and studies over recent years where researchers have made cells biologically younger. One group used RNA therapeutics to essentially increase the amount of telomerase present in the cells to reverse telomere shortening. This sort of treatment is not going to have you throwing your anti-wrinkle creams and hair dye in the bin any time soon but instead might be a way to help treat children with Progeria for example – a rare genetic condition affecting one in a million children, which causes them to rapidly age and to experience a number of health problems. It appears that the fountain of youth is much more than just the telomere story but many more intertwining paths. So, I don’t think immortality is going to be on the cards any time soon. Instead we need to work on the cellular biological processes that define aging. Do you have any more questions about telomeres? Or any other factors that might age our cells? I have only touched on the subject but do you think we might be able to reverse aging in the future, or perhaps even become immortal? What do you think of this research or perhaps you want to know more about it? Would you even want to live forever? Let’s start a discussion in the comments or join the discussion on my Instagram. Really cool! Thanks for teaching me something new! Pingback: 6 things I’ve done instead of writing my PhD thesis – Soph talks science!